Brown Beauty in the City LA: A Pop-Up Wellness Experience — . We would like to thank each and every single one of our Los Angeles based beauties that came out to participate in our Brown Beauty in the City Wellness Pop Up Experience, held on March 5th, 2016 at Lululemon Athletica in the Plaza El Segundo! We had a blast! Did you miss our event? Don't sweat, we got ya covered! Get into the black-girl-magic-filled pics below. 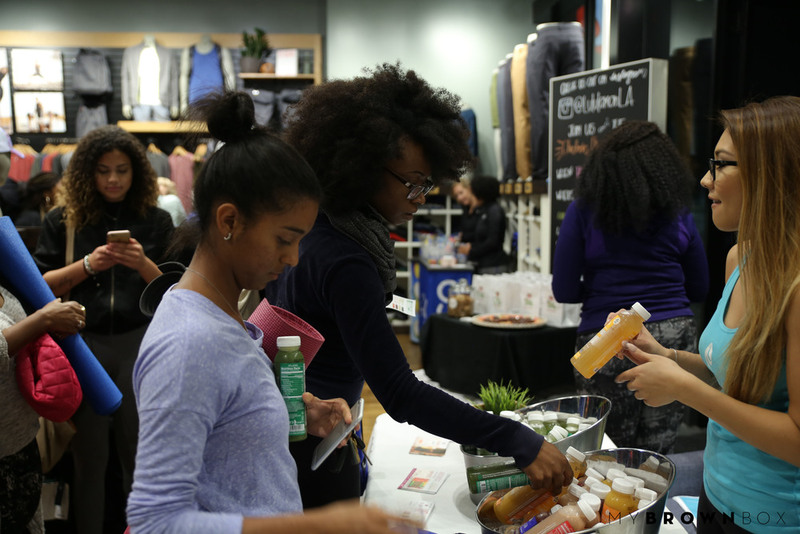 After check-in, beauties were schooled on various healthy snacks and juices, provided by some of our sponsors. Suja Juice company is an organic, cold-pressured and Non-GMO beverage company in the U.S. Their delicious drinks include the everyday vitamins our bodies need to prosper and live a long, healthy life. Thirsty? And thanks to NSI, Evian water was a major key during our wellness experience. What's cocktails without hors d'oeuvres? Raw Cellsorganic vegan snack company graced our snack table with vegan, chocolate chip cookies and donuts. And KIND snacks was KIND enough to slip some of their delicious and nutritious, health bars into every goodie bag. Guilt free cookies and donuts? Say no more. Our wellness experience consisted of a stress-relieving yoga and mediation session with our very own brown beauty and psychotherapist, Tiffany Shelton, creator of Cocoa Butter for the Mind. Meditation with Tiffany, provided all the beauties present with a clear, and peaceful mind, full of positive vibes that we can apply to our daily lives. Sign up for our newsletter to receive love letters with our awesome, inspiring articles by our Brown Beauty community and updates on our next Pop-up Wellness Experience...we may be in YOUR city next!